Expanding social networks and relationships can be rewarding particularly when facing challenges. Derek has struggled with decreased vision, which necessitated leaving his paid employment to pursue employment that is more suitable. Derek sought assistance from CNIB (Canadian National Institute for the blind), and was determined to learn new skills at home giving him a sense of accomplishment and purpose. Derek has also expanded his social network by interacting with liked minded individuals who provided knowledge on preparing meals in his home and the use of his cane, which improves his overall sense of well-being, and contributing to his general satisfaction. Derek has a renewed appreciation for spending time outdoors and pursuing physical fitness. Good luck Derek in your many new and exciting endeavours! A hobby can make a big difference in someone’s quality of life; not only does Dan have a passion for classical music but is a historian who loves to share his knowledge with others. Dan has recently co-developed a project with Poirier Library to bring his passion to others. Dan hosted a Classical Music Appreciation workshop for like minded individuals in the spring of 2017. Dan’s workshop at Poirier Library gives him a sense of accomplishment and purpose through contributing to his community. It provides Dan with the opportunity to expand his social network, providing him with a sense of autonomy and independence. Dan also provides banking services for CISS; making weekly deposits at our local Van City. This job provides Dan the opportunity to expand social networks and build professional conduct. Earning a wage has provided Dan with opportunities to make different choices in his life, contributing to his sense of well-being. Congratulations Dan on your many successes! IDS2 began hosting a social group that works together on public speaking. This group meets once a week, and is filled with supportive learn by doing people that help encourage personal goals around public speaking. Attendees have seen improved self-confidence, and aptitude around speaking in front of a group. Jenny, Brenda and one other individual are fond of the “word of the day” which is utilized for points when conducting ice breakers speeches. Hudson and Lee have been working at Boston Pizza since July 8, 2011, for two hours once per week. Duties include unboxing and weighing chicken and other meats. Hudson and Lee work independently at their position supporting each other through any obstacles. Congratulations! Hudson also works at Coffeehouse. Hudson is John’s assistant managing the concession, while John manages the cash. This is a paid position for Hudson who is very proud to contribute. Scott is notorious for his big grin and engaging laughter, immediately creating lasting relationships. For many years Scott has been an active member of the Special Olympics and is an avid swimmer. Last spring, Scott applied for and succeeded in winning a swimming scholarship sponsored by CLBC/ BCGEU which is enabling him to keep in shape at his Aqua Fit class. Scott’s involvement with sports is extensive and impressive. In the past Scott played ice hockey and attended classes within the martial arts. All of this speaks to how much Scott enjoys socializing as well as being fit. As a participant in the Go-Getters self-advocate committee Scott anticipates his monthly trips to interact with his fellow committee members at Melissa Park. Recently Scott and his peers created new CISS Charter of Rights materials which will be a guide for the Society and will be used as a fundamental part of planning. Individual rights are very important to Scott both for himself and others. For nearly seven years and counting, Scott has been employed by Boston Pizza in New Westminster. Scott looks forward to the social inclusion his position provides and takes great pride in completing his duties. Equipped with a wicked sense of humour and exuding enthusiasm Scott succeeds in finding time to kick back, relax and enjoy the company of his team. John joined CISS in 1995 and has been a steady employee at our Coffee House, Java with Friends, for the past 10 years. John has had a range of job duties since the beginning but has been primarily focused on the concession stand. In order to better help John in his independent work skills at the Coffee House, his support staff, Angel, created an iPad App called ‘Handy Cashier’ for John to use at the concession stand. John has had a renewed interest in his job at the Coffee House because of working with Angel and building on the ‘Handy Cashier’. John has been battling his anxiety of dealing with money and the customers but he has made a lot of progress. When the flow of customers is low, he is able to handle the concession by himself. This new technology has helped him progress much further. A job can make a significant improvement to a person’s quality of life and for Adam Jamieson, his job at Van City, Pine Tree Branch in Coquitlam has certainly made a difference for him. It was clear from the first time that we met Adam that he was a very self-determined man who was willing to work hard at anything that he did. 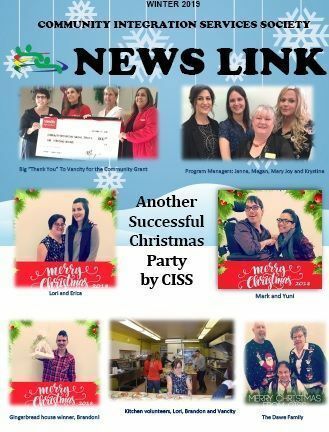 Initially, Adam dabbled in a little of bit of volunteer work leading up to his participation in the CISS Employment Workshops where he was given the opportunity to build on his employment skills. Adam soon proved to be an excellent candidate for the Van City position that Branch Manager Susan Devlin offered to CISS. Adam and his support staff created a series of activities to practise at Melissa Park to prepare him for his interview at the bank. Within a couple of short weeks, Adam was ready for his interview with Susan and he passed with flying colours and was hired to work part time. A working interview worked well for Adam, although stressful like any interview, he was able to show a variety of his skills to the interviewer. Adam is a perfect fit on the team at Van City and is someone who doesn’t mind putting on a tie for the job. He loves to go on team outings and celebrations and fully participates in regular staff meetings with his colleagues. Adam’s colleagues also give back to CISS; his bank Manager Susan and another colleague (Boston) joined us in painting the outside of Melissa Park. Other colleagues of Adam help us at our Annual Christmas Party by serving up lunch. The Van City team know a lot about team work and giving back to community. Adam’s job at Van City also gives him a sense of accomplishment and purpose through contributing to his community. It provides him with the opportunity to expand his social network and social calendar. Each working day, Adam interacts with his colleagues at the bank, strengthening his understanding and practice of professional conduct, improving interpersonal skills, and building professional relationships. Adam has gained a lot of skills which will help him to build on his career path. This job has greatly improved Adam’s sense of autonomy and independence. Earning a wage has provided Adam the opportunity to make different choices in his life. It has enabled him in buying Christmas gifts for his loved ones, and save for a well-deserved vacation. Like all of us making money and working in a fair workplace is essential to our well-being. Adam’s Van City job has greatly improved his overall sense of well-being, contributed to his general satisfaction and built self-esteem and self worth. Anyone who knows Adam believes he seems happier. His physical and emotional well-being has improved. Adam has been going to the gym regularly, and become more fit. Congratulations Adam on your successes! Equipped with diligent focused energy and a cheerful friendly disposition; DongKu is an inspiration. Exhibiting eager work ethics and an amazing flare for art DongKu shares his passion for art with his North Vancouver team. Last spring, DongKu applied and successfully won an art scholarship sponsored by CLBC/ BCGEU. In the fall he began his painting class at Parkgate Community Centre. The beautiful landscape painting he produced astounded both his teacher and fellow artists at the class. One of his paintings now adorns the manager’s office in North Vancouver. The picture has become a conversation piece for visitors to the office; in fact, one recent guest expressed an interest in DongKu’s painting. DongKu may paint more pictures to display in the office, perhaps this is future employment for this artist. DongKu has successfully held several paid positions. Currently, and since 2011, DongKu has been employed at Heike’s Hair salon where he is responsible for a variety of job duties that he enjoys doing. Until recently DongKu held an additional position at Fresh Slice Pizza where he assisted in preparing pizza dough and kitchen duties, until unfortunately the business laid off some of their staff. DongKu is hoping to be recalled for work at a later date. Matt is a pleasant young man with a great sense of humour, is energetic, and engaging. Matt has a passion for technology and enjoys video editing and making music. To increase independence through personal development, Matt recently became involved in a video editing project to assist CISS in updating its website. This involves Matt’s technical expertise in sound editing and visual effects in order to create a more engaging information experience in regards to CISS as an organization. Matt engages in community and began a social club at “Java with Friends”, a weekly get together, through this. He teaches others how to play card games, and connect individuals through shared interests. Keeping connected through social media provides Paul with independence and autonomy. Paul interacts through email and text messaging keeping everyone up to date on the comings and goings at CISS (Community Integration Services Society). Additionally, Paul’s job at Boston Pizza provides him with opportunities to expand his social network and well-being; this contributes to his satisfaction and self-esteem. Paul works hard at his second paid job at CISS; providing janitorial services. Paul’s third paid position provides lawn maintenance; Paul is a very busy man! Paul has gained many skills, which will help him to build his resume and career. This includes NVCI (nonviolent crisis intervention), FA (first aid) and Ergonomics training. Paul’s emotional well-being has improved allowing Paul to make many different choices. Paul keeps fit by walking and using transit, improving independence, well-being and self-worth. William has developed an increasing awareness of his rights by way of Toastmasters, which is a public speaking group that meets every Wednesday. William has achieved two, seven minute speeches and regularly participates in different positions in the Toasters group. He has taken on such roles as Timer, Sergeant at Arms, Chair and Grammarian. William’s efforts earned him a scholarship for Toastmasters from CLBC/BCGEU but more importantly he gained confidence which has assisted him in all aspects of life. William has now set his sights on employment stating he “feels the right opportunity is just around the corner”. With his positive attitude, anything is achievable. With a ready smile and friendly persona Darren demonstrated a desire for independence when he sought paid employment. Five years ago, Darren became an employee of Korna Pet Foods. At Korna, Darren does an amazing job keeping the shelves neatly stocked while insuring that packaging materials are properly recycled. Darren appreciates the social atmosphere of the pet shop and enjoys greeting his coworkers and customers who frequent the store. Until recently Darren enjoyed attending a ceramics class until it closed its doors. When Darren expressed an interest in art and that he missed the class, he enrolled in a new pottery class enhancing his social participation in community. When not working or attending his pottery class Darren can be found swimming or working out at the gym. The IDS2 Program wishes to thank CLBC and BCGEU for awarding educational scholarships. The generous awarding of funds has allowed Michael to maintain his physical well-being through weight training instruction with a personal trainer; John’s scholarship enabled him to access the Rosetta Stone language program so he can engage in conversation with his in-laws that speak Taglog; and Andrea is able to further explore her creative side by utilizing the funds awarded to her for creating modern resin-like canvassed artwork with colorful acrylics. Andrea purchases flowers at a local garden shop before volunteering her time at Nicole Lodge. Andrea’s infectious laugh and smiling eyes have a positive effect on the senior’s that she delivers flowers to. One of the resident’s husbands came to let Andrea know how much it meant to his wife that Andrea delivers flowers each Friday. This is important as this seniors health is deteriorating and she remembers very little, but had told her husband how happy she was that there would be a volunteer bringing flowers to the residents every Friday. Andrea seems happy to make a difference in the lives of the Nicole Lodge residents. Mike began working at Boston Pizza in Coquitlam two years ago. In this position his primary responsibility is to assemble the boxes to ensure a seamless day before the busy lunch hour hits. Mike’s position at Boston Pizza enables him to expand upon his skills and increase his confidence level by gaining financial independence. At the end of a shift, Mike likes to turn up the country music and unwind after a hard day’s work.